Leprechauns may bring you luck, but I’ll bring you fish. 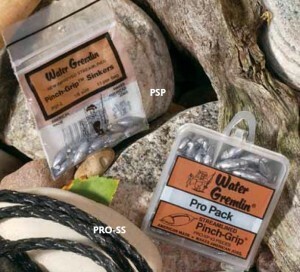 Water Gremlin’s Pinch-Grip is easy to use. Just squeeze the flexible ears with your fingers to easily take the sinker on and off your line. No tools are needed. The revolutionary POWR-V-SLOT and grooved design jaw grips line tenaciously… yet gently, without damage and the streamlined shape lets you take your bait down through the weeds where the “keepers” are biting. Sizes shown: #1, #2, #3, #4 and #5. Available in Pro Packs and Zip-Lips.